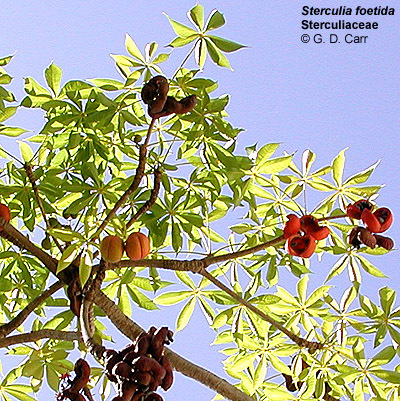 The Sterculiaceae are trees, shrubs, or herbs comprising about 65 genera and 1,000 species that are further characterized by the presence of stellate hairs. The leaves are alternate and simple or infrequently palmately lobed or compound; stipules are present but they are shed early. 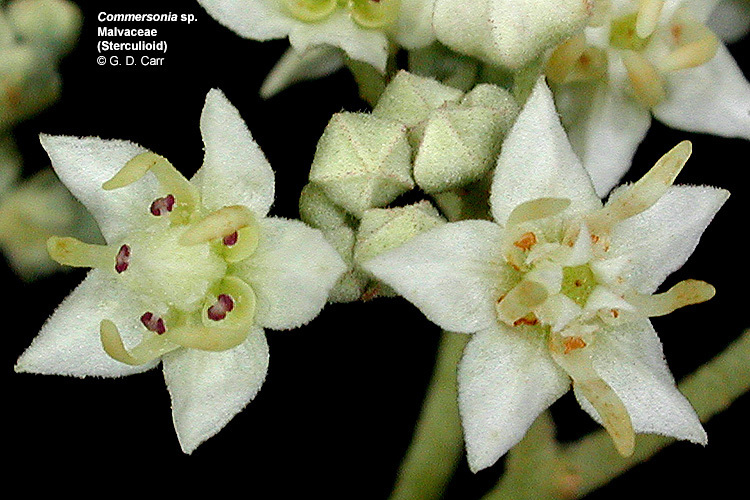 The flowers are actinomorphic or rarely zygomorphic, and are bisexual or not uncommonly functionally unisexual. 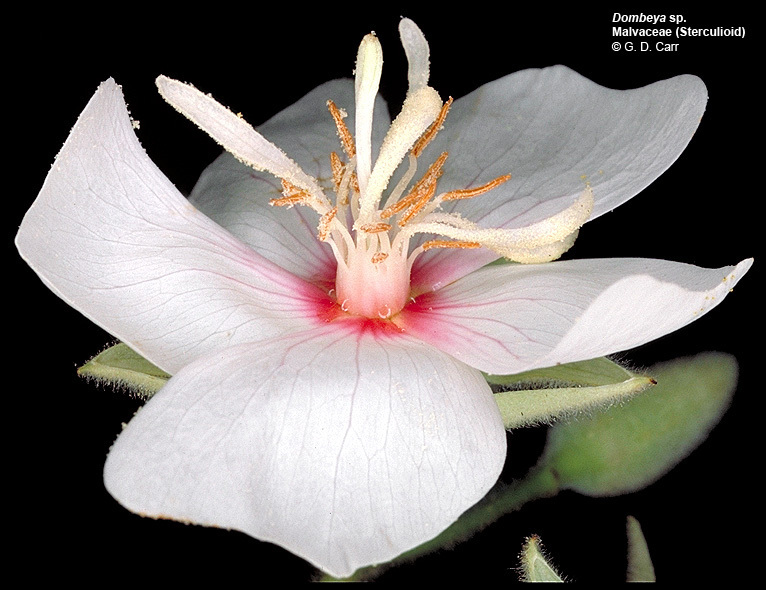 The perianth is commonly uniseriate, consisting of 3-5 valvate, basally connate sepals, but sometimes an equal number of petals are also present. The androecium most frequently consists of two whorls of 5 stamens each, these united by their filaments into a tube that commonly surrounds the ovary or arises from an androgynophore. The gynoecium consists of a single compound pistil of usually 4-5 sometimes weakly associated carpels, an equal number of distinct or variously connate styles, and a superior ovary with usually 4-5 locules, each with 2-several axile ovules. The fruit is variable; sometimes the carpels are completely distinct at maturity. 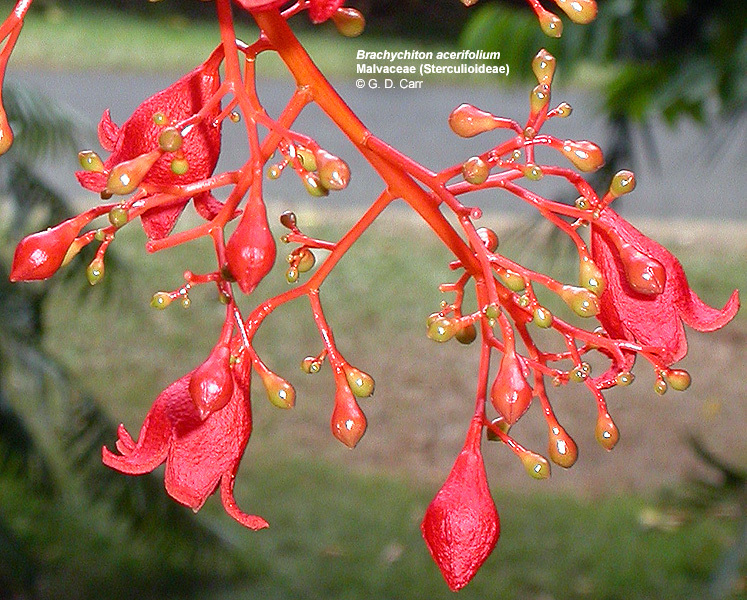 Brachychiton acerifolium, flame tree. Note uniseriate perianth, part of which has been cut away in both flowers illustrated. 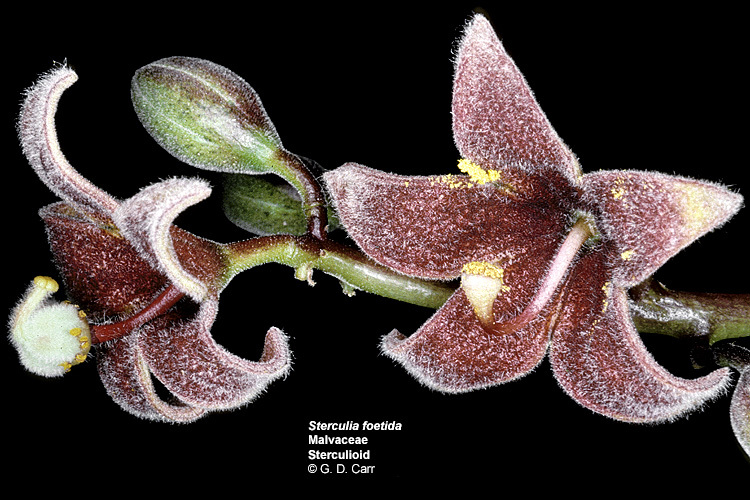 The middle photo shows a functionally female flower. The right photo depicts a functionally male flower. 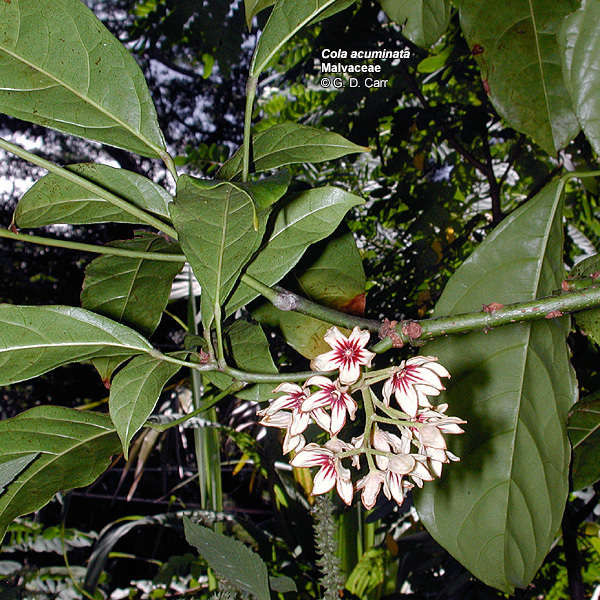 Cola acuminata, cola nut. 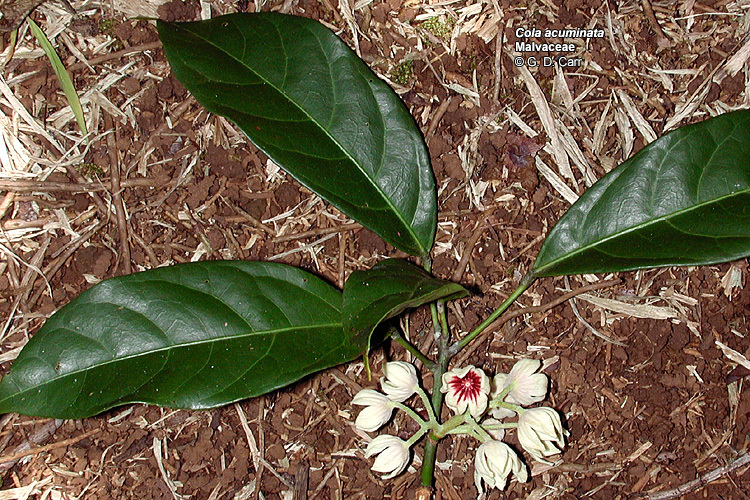 3,4 - male flowers, 5 - male (l) and female (r), 1-5 - Lyon Arboretum, Manoa, HI. 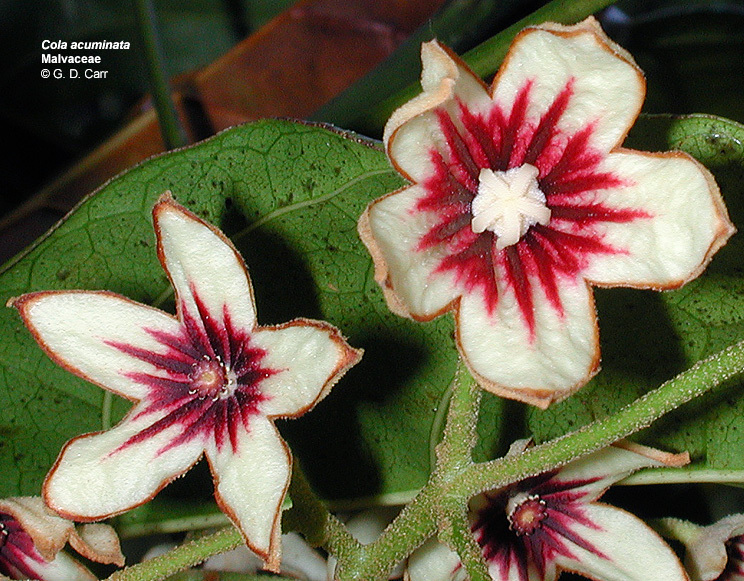 Dombeya sp. 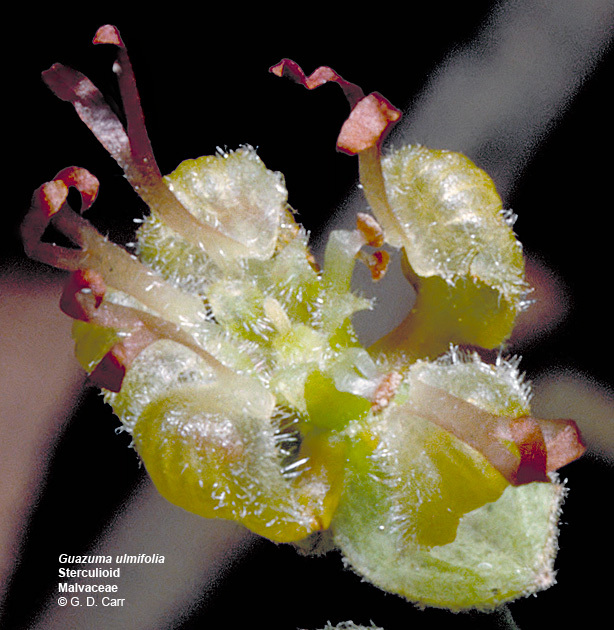 Note staminal column with 5 tongue-like staminodes and about 15 stamens. 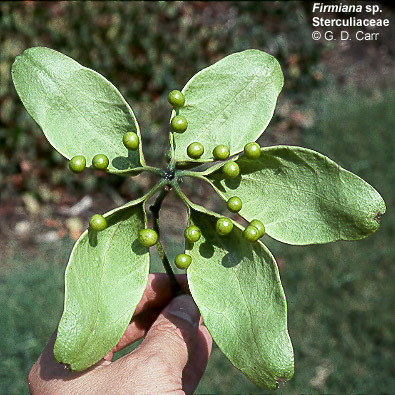 Firmiana sp. This capsule developed from a single flower. At this point the carpels are nearly distinct and each bears a striking resemblance to a modified leaf with marginal seeds. 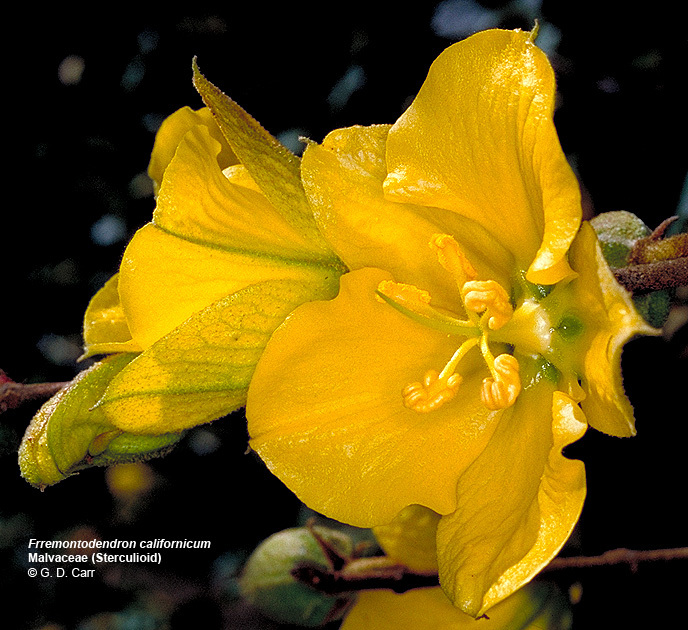 Fremontodendron californica. In this species the flowers are bisexual and have a well developed corolla. The style of the functional pistil is protruding from the column formed by the monadelphous whorl of 5 functional stamens. Guazuma ulmifolia, West Indian elm. 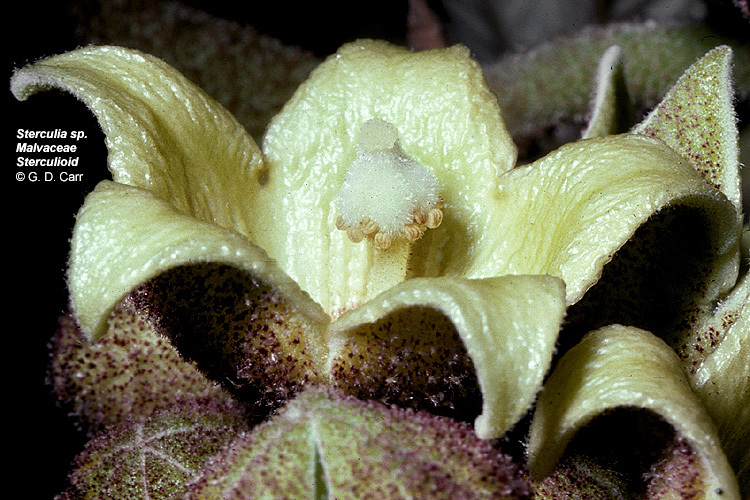 In this species the sepals are somewhat ephemeral. 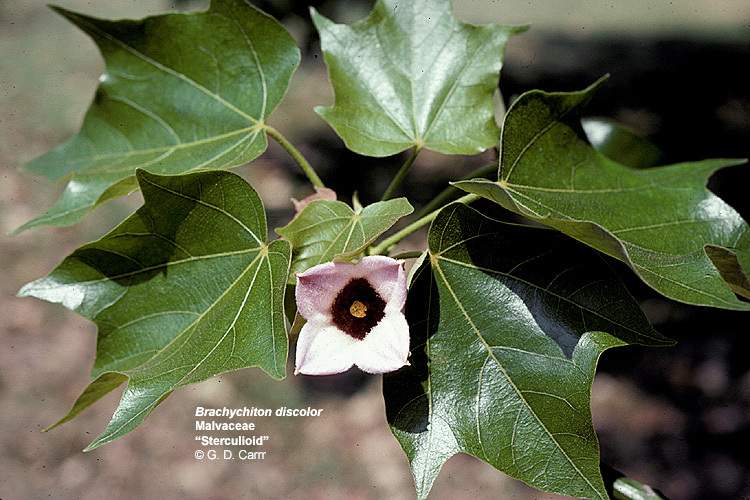 The small yellowish petals are slightly hooded and have a forked brownish appendage. A monadelphous column of greenish stamens surrounds the light green pistil visible in the center of the open flower. 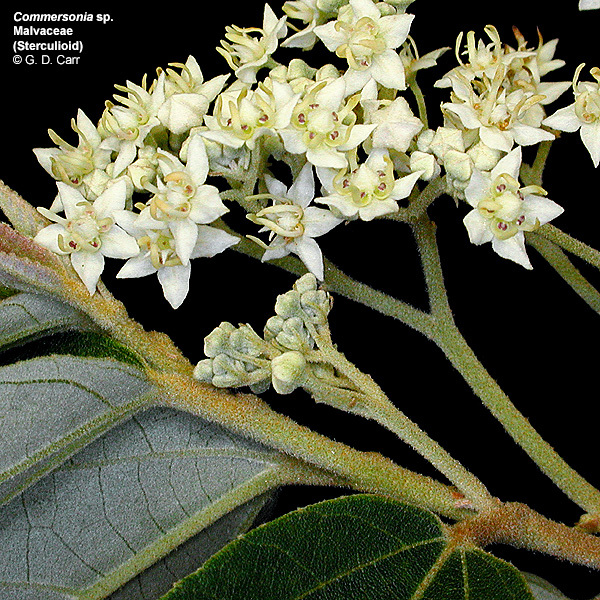 Heritiera littoralis, looking-glass tree. 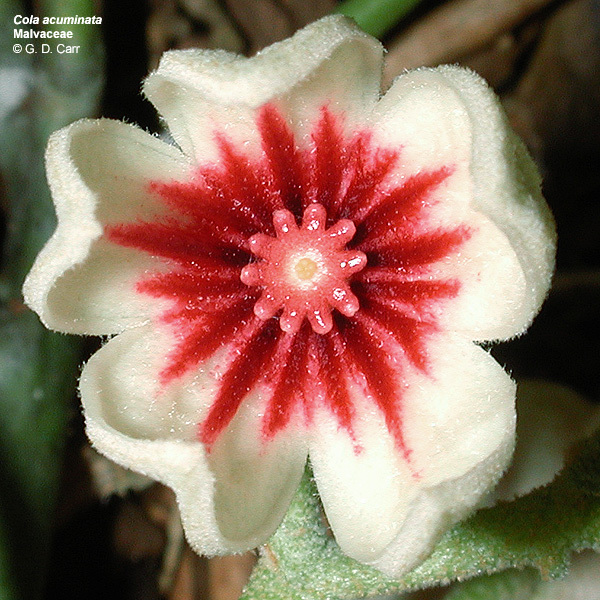 The upper flower is functionally female, the lower flower is functionally male. Pterygota alata, Buddhas coconut. 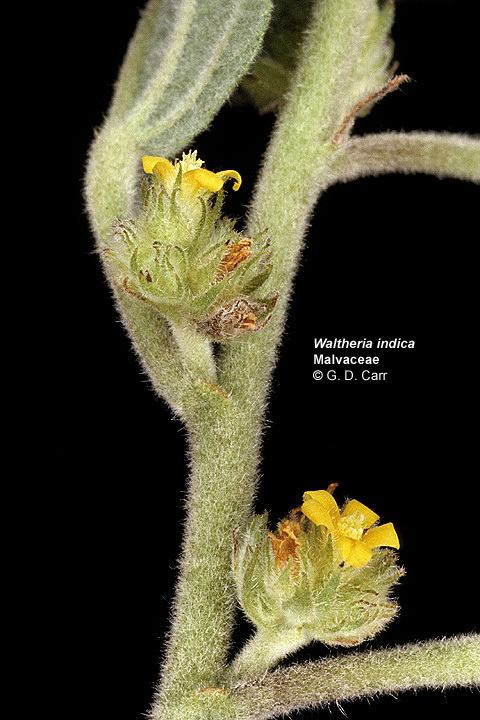 These are unisexual flowers with a single perianth whorl consisting of a valvate calyx. 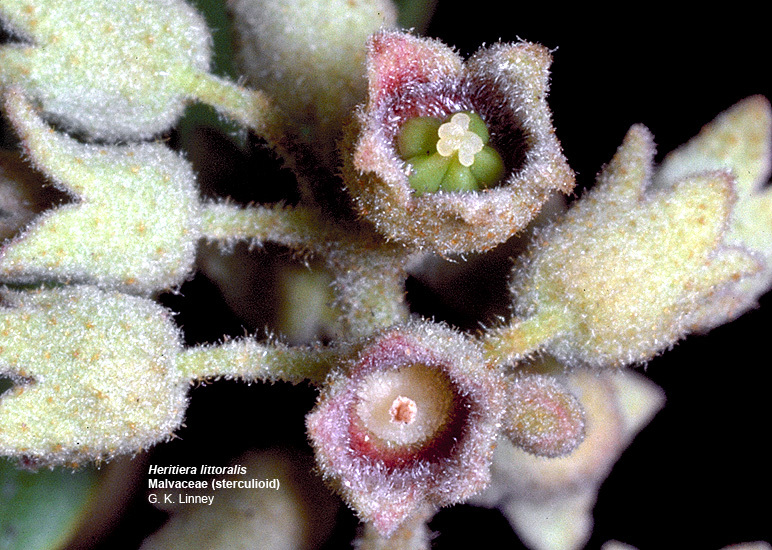 One sepal has been removed to reveal the interior of the flowers. 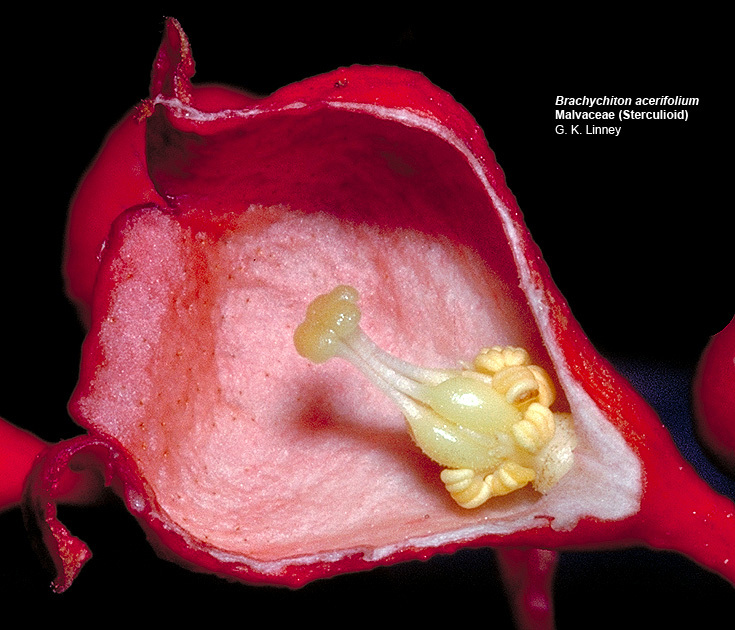 On the left is a female flower with vestigial anthers visible at the base of the ovary. The pistil has 5 distinct styles. 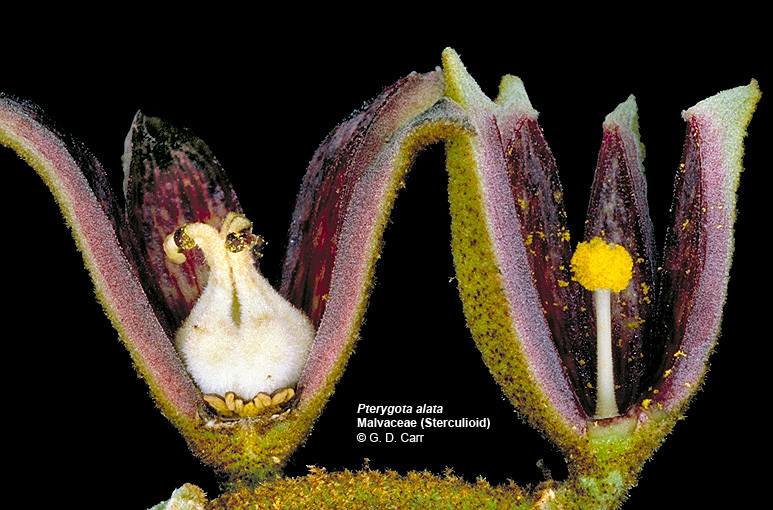 The male flower on the right has functional stamens united into a monadelphous column. 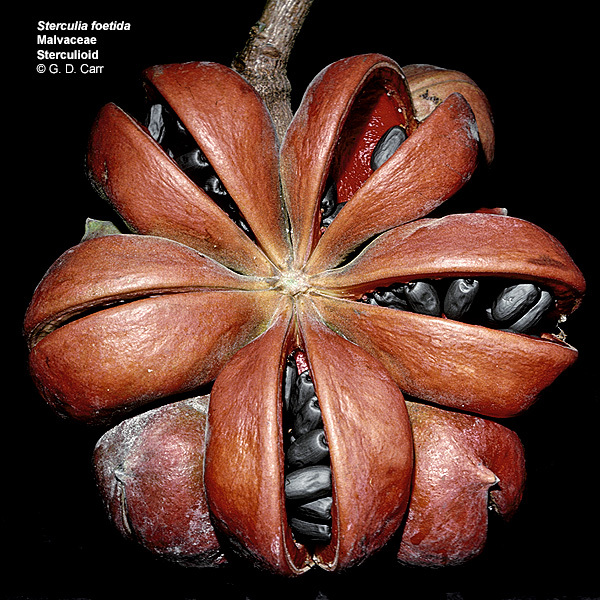 Sterculia foetida, skunk tree. These are functionally unisexual flowers with a single perianth whorl constituting a valvate calyx. 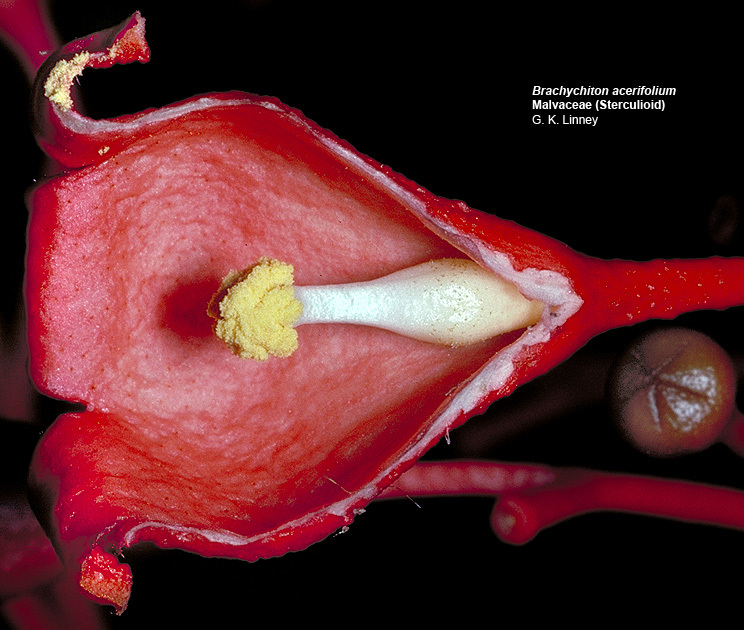 On the left is a female flower with the anthers of vestigial stamens visible around the base of the stalked ovary. 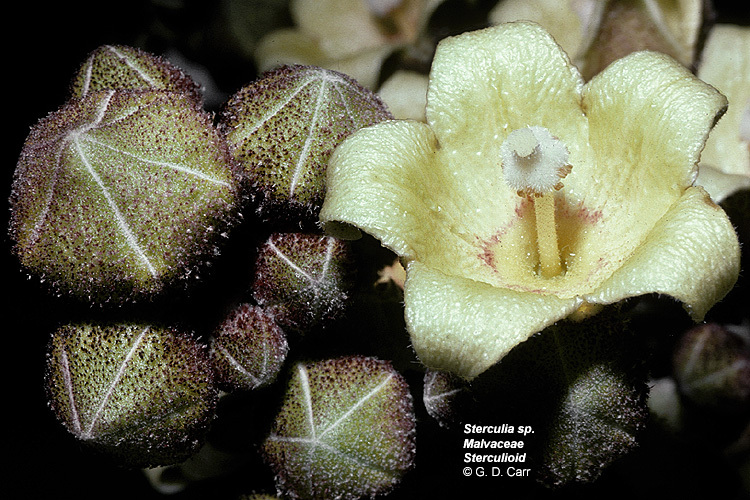 The flower on the right shows little or no evidence of an ovary. The stamens are functional and united into a monadelphous column. 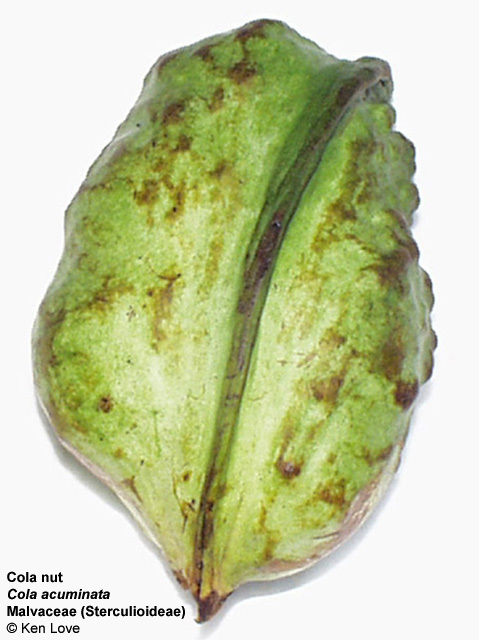 Theobroma cacao, cocoa. 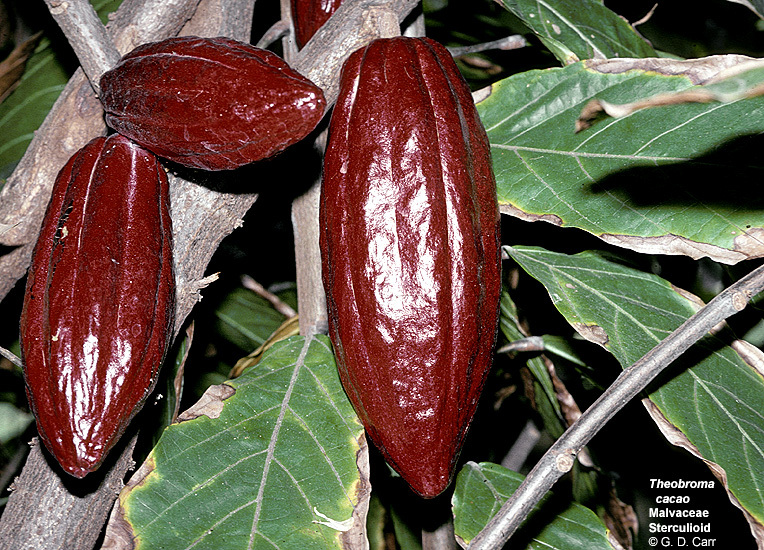 The seeds in these richly colored fruits are the source of chocolate. 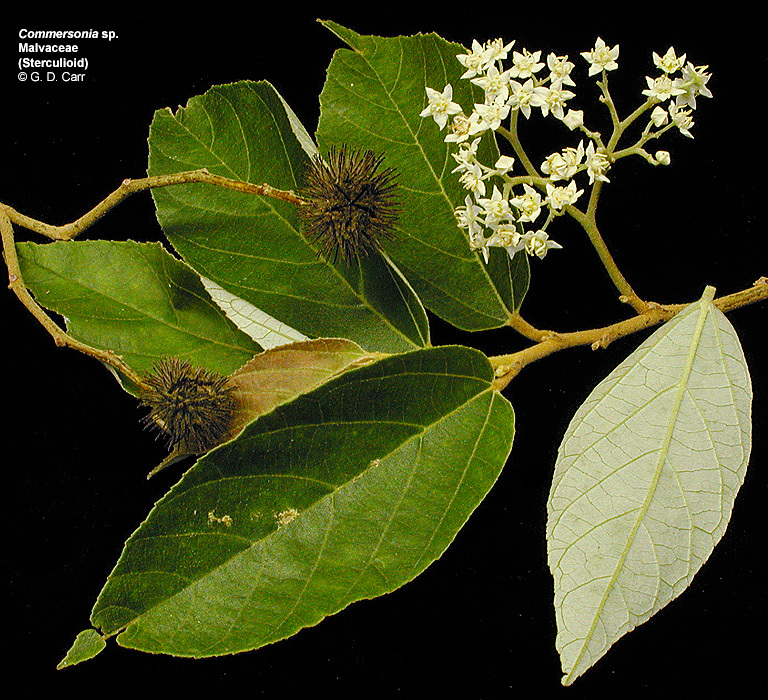 Waltheria indica, 'uhaloa. 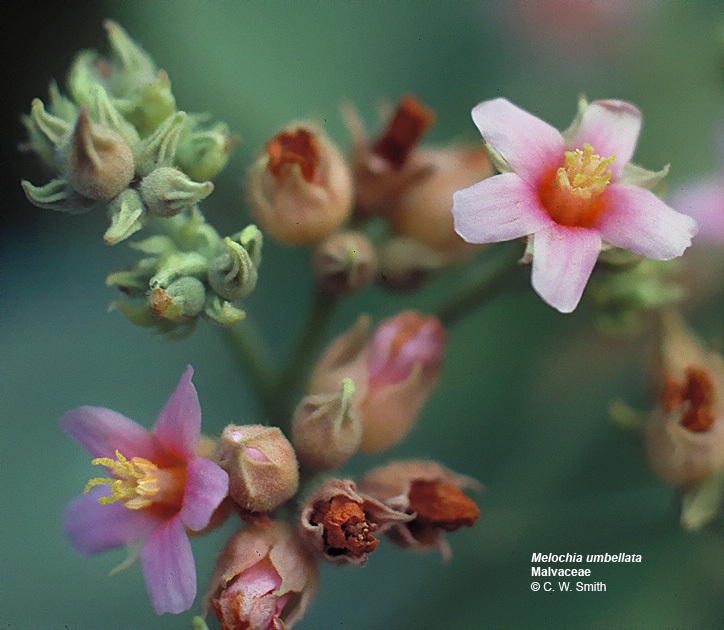 This native Hawaiian species is used to brew a tea for treating sore throat. Notice the brown linear stipule at the upper node and the brown stipular scar at the middle and lower nodes.